Wanda Guadamud is all smiles as she practices her serve. Wanda Guadamud with her 3.5 women's team. After recovering from a battle with breast cancer in 2005, Wanda Guadamud picked up a racquet for the first time and has been hooked on the sport ever since. She is the captain of a 3.5 women's team and co-captain of a 7.0 mixed team and a combo team with her husband Mario in Baton Rouge, La., Guadamud, 47, is also a mother to two sons, Jeremy and Joshua, has a part-time job and co-founded a business called Frockz, which creates lamp shade slipcovers. She was nicknamed "the net monster" by her teammates for her love of playing at net, has been named February's USTA League Captain of the Month. Wanda Guadamud: I like Serena Williams because she is such a fighter, is so aggressive, and she never gives up, no matter what. Wanda Guadamud: Hard court. We usually play at the local public parks, and they are all hard courts. Wanda Guadamud: I actually love all of the Grand Slams, and my husband and I are glued to the TV set for them all. If I had to pick one, I guess I would pick the French Open because it is in Paris (never been - but will one day!) and because it is played on clay, which allows the players to slide and gives the game a different look and excitement. USTA.com: What is your favorite professional sports team? Wanda Guadamud: NEW ORLEANS SAINTS! I grew up outside of New Orleans. It was a blast last year when they finally won the Super Bowl. Everyone was so elated! Wanda Guadamud: My backhand is my better side, and I absolutely LOVE the net. My teammates call me "The Net Monster." Wanda Guadamud: Either one of the Bryan Brothers for mixed and Serena for women's doubles. I wouldn't have to do a thing! Wanda Guadamud: Like I said before, I would love any of them, but the French would probably be my pick because of the difference in the play of the game on clay. USTA.com: How did you start playing tennis and captaining? Wanda Guadamud: My husband and I started playing tennis in the spring of 2005. I had recently recovered from chemotherapy from having breast cancer, and we were looking for something to do together. Neither one of us had ever played tennis before, nor had we had any lessons. We were watching one of the Grand Slams on TV and decided that we wanted to play. We were arrogant enough to think, "We can do that!" Then my husband signed us up for a novice league at one of the local parks. From that league, we met many people just like us, starting out. 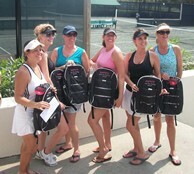 That summer we were asked to play on a USTA Mixed team, and from then on, we were hooked! I captained a team in the fall and have been captaining ever since. Some of the people that we met during our novice league are still with me. I have lived in Baton Rouge for 30 years and have met more people and made more friends playing tennis in the past five years than I have in all the other years living here. Baton Rouge has a tremendous and fanatical tennis community. We absolutely love it! USTA.com: Why do you love playing tennis? Wanda Guadamud: I think I love it most because I am actually kind of good at it and I have never played sports in my entire life. I have always been very uncoordinated and never felt good enough to play competitively. When I started playing tennis, I thought I can kind of do this. I really love it. I said to my husband ‘Why did not start playing when I was young?’ It is something I would have loved to have done all my life. I told my friends they need to start playing. I have met so many people in this town I never would have met otherwise if it was not for tennis. It is a very big tennis community here.. I like the competitiveness and the social aspect of it. Wanda Guadamud: I am a control freak, but also because the people that I play with are so awesome and they make it easy! And I never have to captain alone. Lillian Pasos is my right-hand girl, and I don't make any decisions without consulting her. Love her! Also, when I captain the Mixed team in the summer, my husband Mario, as well as Lillian, are right there with me. Wanda Guadamud: The USTA makes the game competitive and so easy. All of the people that work for the USTA are helpful and organized. Baton Rouge has an incredible group of people that keep all of the players informed, organized and happy. All we have to do is go out there and play... which is what we want to do! I hope that everyone realizes what a wonderful organization the USTA is and how we (tennis players) wouldn't be able to compete the way we do without them. USTA.com: Did you know you were nominated as Captain of the Month? How did you feel when you found out you won? Wanda Guadamud: It is kind of funny because I got the email from our league coordinator, she had sent it to the captains in the area about the Captain of the Month entries, and she asked us to forward it on to our teams. I thought I am not going to forward this to my teammates, I don’t want to ask them to nominate me, so I didn’t. I found out I won when I got the email from the USTA telling me I was Captain of the Month. I had a feeling it was Lillian, she is my co-captain, so she probably got the email too and she took the initiative and nominated me. I just very excited and I thought it was really, really nice. It has been pretty nice being a captain since I started playing tennis six years ago. My husband and I, he captains teams, I captain teams and we captain a 7.0 Mixed team together. It can be very stressful when you are a captain and you have to figure out who to play, when to play them and the schedules but I love doing it and I love all my girls. We have such a blast together. USTA.com: How do you balance being a captain and playing on teams with all the other aspects of your life? Wanda Guadamud: I just fit in like everything else. I love it so I don’t mind it. I have a part-time job that I have had for 15 years for a physical therapy network and my neighbor and I have a business that we started. We invented Frockz, which are lamp shade slip covers. They are made out of stretchy fabric so they can fit any size or shape lamp shade and they are in funky patterns so you can change up the look of your room. We started it three years ago and we have to travel a lot to go trade shows but I manage to get in as much tennis as I can.